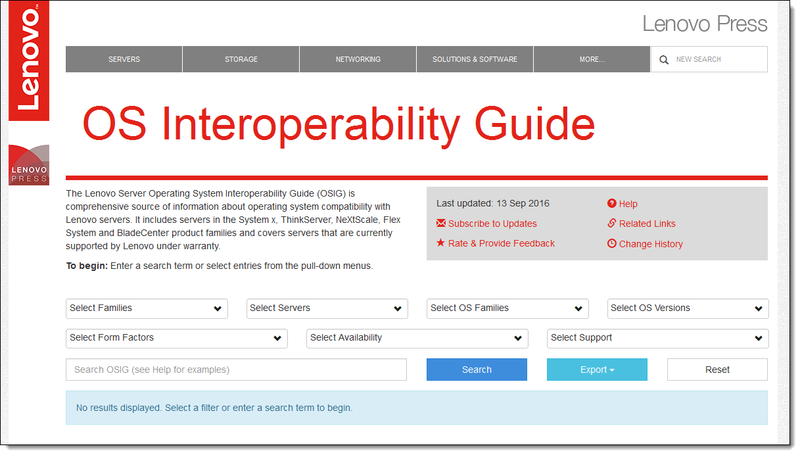 The Lenovo Server Operating System Interoperability Guide (OSIG) has been published in PDF form for 12 months now. 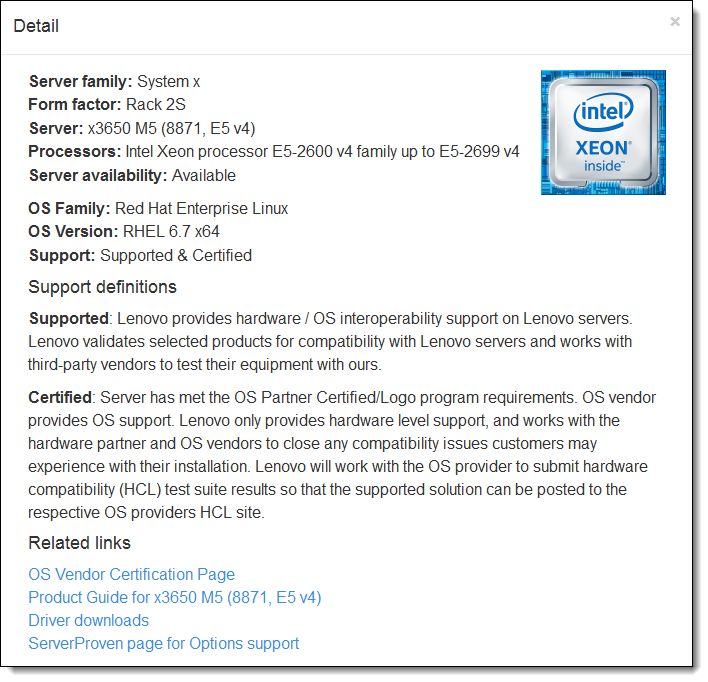 With more than 26,000 downloads, it has proved to be a valuable resource to people looking for OS compatibility information about Lenovo servers. We have just released a brand new interface to the data: a new mobile-friendly, web-based application with dynamic filtering, flexible search capability, and additional details and links to related information. This article introduces you to the new web interface and the features it offers. And we're live! The new web application is now available. The Lenovo Server Operating System Interoperability Guide (OSIG) is the official resource for information about which operating systems are supported on Lenovo servers. It was first published in PDF form about 12 months ago and so far has been downloaded more than 26,000 times. To make the guide even easier to use, we have now replaced the PDF format with a new web-based application that you can able to access from your desktop browser or from a phone or tablet. It provides search and filtering mechanisms to quickly locate the information you need. The new web interface is at the same URL you use previously used to get the PDF version: http://lenovopress.com/osig. Even the long form URL will redirect to this URL, so there is no need to change your bookmarks. 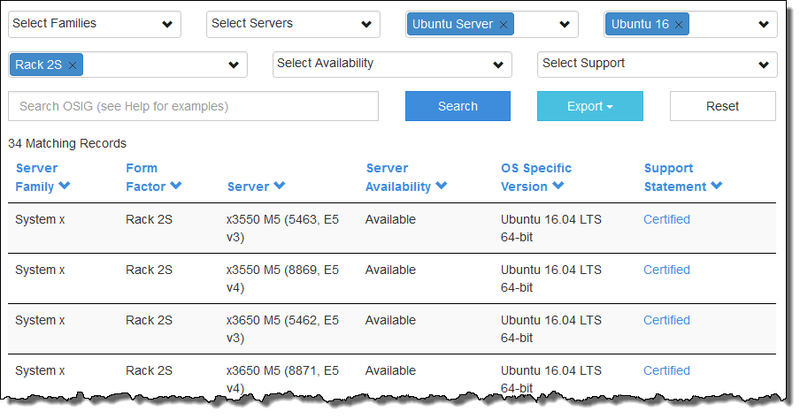 Select Families: System x, ThinkServer, NeXtScale System, Flex System and BladeCenter. Select Servers: These are all the individual servers in each of the families. Select OS Families: Chose from Windows, RHEL, SLES, VMware ESXi and others. Select OS Versions: These are the major releases of the OS. Select Form Factor: Not sure what server or family you want to filter on? You can start with 2-socket rack servers, for example. Select Availability: Filter on servers currently available or withdrawn from marketing. Select Support: Select from Supported, Certified or Tested. In each of the search results above, the support statement column contains clickable links. Clicking the link opens a popup window with details about the support. Export to Excel: Gives you an XLS file with the results you have displayed. Useful if you want to insert as a table into a document. Export to PDF: Gives you a fully formatted PDF of your search results. Export to XML: Do you manage a web site with content about Lenovo servers? With this XML file you can use the OSIG API to generate real-time OS data and display it on your web site. Great for business partners! Download Master File: If you need to work offline or perform more complex filtering on the complete OSIG dataset, then you can download this 11,000+ row spreadsheet file. Subscribe to updates: Enter your email address and we'll send you an automated email whenever we make updates to the OS compatibility data (e.g., new support or new certification). Rate and provide feedback: Have comments or a suggestion about OSIG? Send it to us here! Help: Guidance on how to use the OSIG. Related links: Here we list links to OS vendor web sites and other useful web resources. Change history: We keep the OSIG data up-to-date. This page shows you all the changes made. Excel® and Windows® are trademarks of Microsoft Corporation in the United States, other countries, or both.